Liverpool are set to be without striker Fernando Torres who is set to undergo a knee operation and will be out for six weeks. Liverpool manager Rafael Benitez is set to be without Fernando Torres after the club revealed he requires a knee operation. 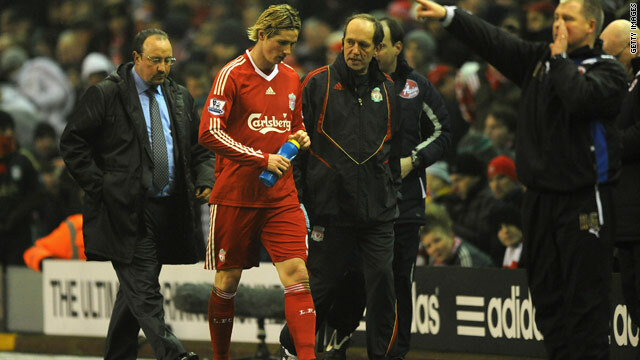 Torres suffered the injury in Liverpool's 2-1 FA Cup defeat to Reading and will be out for six weeks. Under-pressure Benitez is also set to be without captain Steven Gerrard and Yossi Benayoun for the next few weeks. (CNN) -- Liverpool manager Rafael Benitez is set to be without Fernando Torres for six weeks after the English Premier League club revealed he will undergo an operation on his right knee. The 25-year-old striker was withdrawn during Liverpool's 2-1 defeat to Reading in the FA Cup and will now miss the Merseyside derby against Everton and February's league matches with third-placed Arsenal and fourth-placed Manchester City. Under-pressure Benitez is also set to be without captain Steven Gerrard and Yossi Benayoun who have joined Torres on the treatment table. Gerrard will be absent for two weeks with a hamstring strain, while Benayoun faces three to four weeks on the sidelines because of a fractured rib. A club spokesman said: "Steven Gerrard and Fernando Torres both underwent scans earlier today after coming off in the FA Cup tie against Reading. "Steven has a hamstring strain and will be out for a fortnight, while Fernando has torn a cartilage in his right knee. The injury will require surgery and he is expected to be sidelined for six weeks. "Yossi Benayoun also suffered a fractured rib in the game and will be unavailable for between three and four weeks." The setback will be a further blow to Benitez who is under further pressure as his side followed up their recent struggles in the Premier League and Europe with defeat against Championship side Reading.